Socrative is a free student response system that works on any device. With its built-in quick questions and quiz options, it is an incredible resource for formative and summative assessments. However, Socrative can be used for more than just quizzes. A backchannel is a digital conversation that runs concurrently with a face-to-face activity and provides students with an outlet to engage in conversation. Consider using the short answer option within the Quick Questions to give each student an opportunity to share his or her ideas before engaging in class discussion. For those students who may prefer to communicate in writing, or who might need more time to formulate their thoughts, this can be a great way for them to share their ideas. By using Socrative instead of a more public backchannel tool such as Padlet or TodaysMeet, students may feel more comfortable sharing their ideas. Teachers may also consider using a teacher-paced quiz as a backchannel. Discussion questions could be crafted in advance and then pushed out to students as a way to guide the face-to-face conversation. While the initial intent of a Socrative Space Race is to provide some element of competition for students as they progress through an activity – Greg Kulowiec has a great blog post about how to do this. In a science lab, a Space Race could be used to present lab procedures and capture data across lab groups. With the space race projected, lab groups and teachers have a virtual progress board. Upon completion, the spreadsheet report could then be shared with the students so that they can analyze not only their observations and data collection but also that of the entire class. 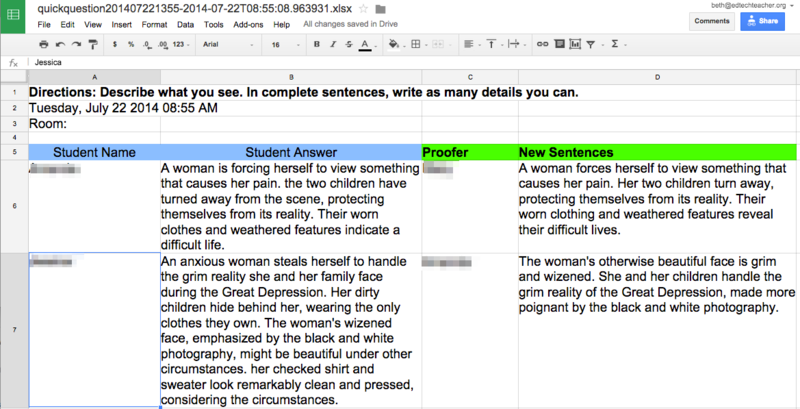 Shawn McCusker (@shawnmccusker) uses Socrative to help students craft thesis statements. By asking them to type their draft theses into a short answer Quick Question, he can then push the sentences back to the class for a vote. As a group, they can discuss what makes a strong thesis statement and offer suggestions to their peers. Students can then rewrite their statements and submit them for voting as many times as needed in order to collaboratively improve their theses. The individual PDF reports can be edited using a PDF annotation tool such as PaperPort Notes (iOS) or DocHub (computer/Chromebook). The PDFs could also be converted into Google Docs and then edited using the “Suggestions” feature. The spreadsheet report can be shared with students as a Google Sheet and then formatted to include a “feedback” column. 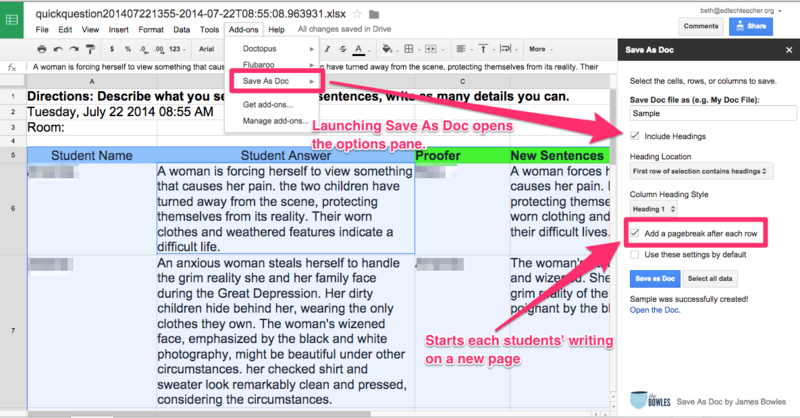 Using the Save-as-Doc Add-On in Google Sheets, teachers can take the Socrative report and convert it into a GoogleDoc to be shared with all of the students as “Comment-Only.” Once the Doc has been generated, students can use the Suggestions to provide feedback to their peers, and teachers then have a single document with all of the writing as well as the edits in one place. When looking for one tool to use in a number of ways, Socrative is a great option for all areas of the curriculum.